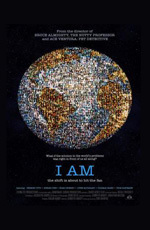 I AM is the story created by Tom Shadyac after coming face to face with his own death. He threw together a small film crew, and went in search of answers from the greatest minds of our time. He started by asking “what’s wrong with our world?” and “what can we do about it?” and ended up discovering just what was so incredibly right with the world. With insights from some of the greatest minds and most influential leaders of our time, I AM is an engaging story of our inherent interconnectedness and how that makes our experience on Earth as amazing as it is.